I love Katie's kitchen! It is cuter than mine for sure. You do such a nice painting job. I love it! Spray paint is seriously up there on my top 10 favorite inventions/innovations/whatevers. I drop by for a visit from time to time, but when I saw the title for this post I HAD to take a look! I LOVE spray painting things too! Love to see what else you come up with! I've been doing some spray painting recently too but it gives me a woozy headache. Even if I do it outside in the fresh air. Must get some sort of industrial mask or something. I like this spray painting idea. I bet you have to hold back though, I think its probably addictive! I've just posted about a patchwork quilt that I've just finished, just thought you might be interested. You're a genius! Love everything that you do. Every post inspires me! I've been meaning to ask you, where have you bought all of your quilt racks and hangers? They're kind of hard to fine, esp non-crappy looking ones. You have so many cute ones, so I was just wondering. okay how can you take spray paint and get . . .amazing! i'm not sure i would even know where to start, maybe i need to do some yard saling to see if there are any paintable things out there. I so wish I new what to call my style too. My husband says just call it comfortable. But tht seems SO boring. Like like your eclecjunktry much better! whatever your style is--I love it! I've decided I need more than one house so that I can use all my favourite decorating styles. unfortunately traditional modern and shabby chic don't generally mix. Ok - you are an expert spray painter! How about a non-drippy even-coated spray painting tutorial?! That would be awesome. I think your style is elegant country. I've been wanting to spray paint something. I don't know exactly what it is, but I found this pink that I've been wanting to try. Set everyone's expectations low - no one will be disappointed. I use that trick all the time. Gotta love the spray paint!!! I LOVE your style! The little boutiques in the well-off, everything costs a million dollars neighborhood, have your style. i never thought to paint my baskets. 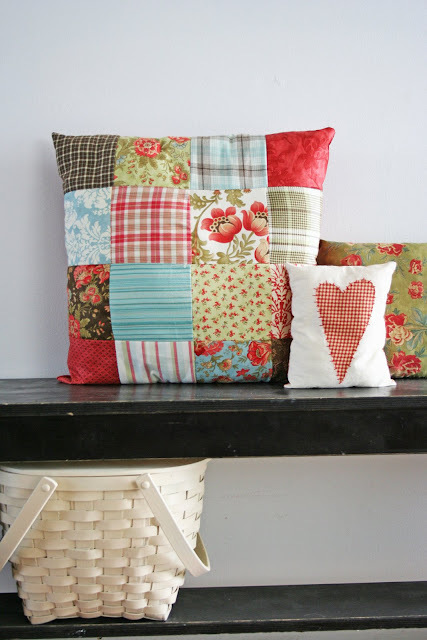 I heart that little heart pillow! Such inspiration...! love the prarie paisley table runner. Might just have to have that one! 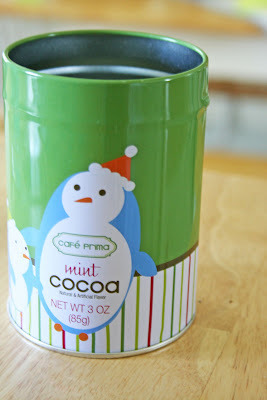 I'm headed to the cupboard to pull out a can of green spray paint!!! Okay, All your spray painting always looks so good! No drips, streaks, etc. You should definitely do a spray painting tutorial with all your helpful hints for us who WANT to try but are scared to start! Maybe a tutorial from when you do your armoire??!!! Thanks for sharing! You always inspire me. I'm with angela and MegJill. Tutorial, please! Whatever your style is... I love it! That can is the perfect thing, and the basket has a whole new life. You know, I've never tried spray paint... I always do the brush thing. I'm so old-fashioned... I've GOT to get on this spray paint bandwagon! V...I absolutely love your style and the projects that you are working on. I love the way your basket turned out--I'm with the others on a tutuorial...sounds like an awesome idea! Super cute. Makes me want to paint my baskets too! okay on the tutorial. i'll see what else i can spray paint. as for my quilt racks i've gotten them everywhere. some at second hand stores (the wood ones) one a a craft store (the metal one) and one was an a walmart find. I KNOW crazy but jake found it for me and gave it to me for christmas. i haven't seen them there any more. I might have to start spray painting baskets. And do you need a special primer to get spray paint to adhere to a metal can? whatever your style is, I love it! 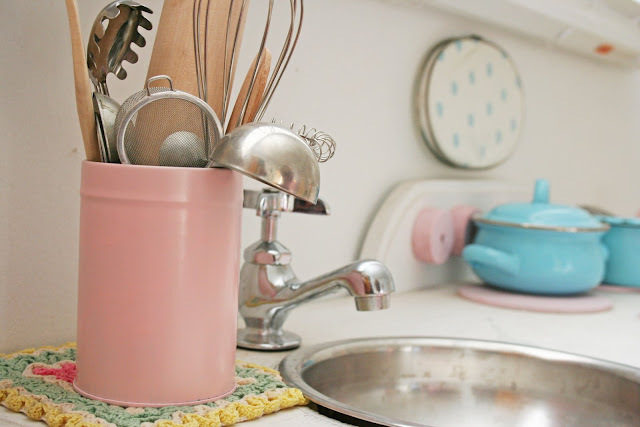 That kitchen is just the sweetest thing ever! I'd never think to paint a can like that, you're too clever! I love that cream color! Is that a spray paint, if so, what brand/color. Very nice! I love your style... you can call it whatever you want! Love what you've done! I've been spray painting up a storm lately, too. ps. My style is also country+junk. It drives my husband nuts! Awesome! I love painting stuff! I was thinking of having a mr. linky party for people to link to posts of their favorite paint transformation. I've been painting stuff like crazy this last year. Raise your hand if you love Rustoleum! i'm raising my hand and i think a mister linky would be lots of fun! i love how spray paint transforms things. i need to get a few cans in pink. oh, the fun that i could have!!! yes, cream will a cool color!! Man, you're a good painter/spray painter. Somehow, all my stuff still ends up looking like crap. You're getting sun? I think northern UT has been transported to Washington. But without any Edwards to brighten our days. Okay, you're inspiring me to buy cans of spray paint. But just like my photos, what ever I do will just not turn out half as good looking as yours. You're amazing, girl. i just found your blog and love it...love the spray painting. i can shy away from painting thinking it will take too much time. this gives inspiration! 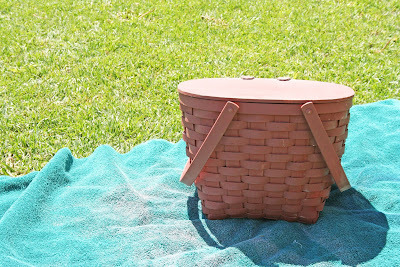 Your picnic basket makeover is so fun! I love the idea of a picnic with that brightly covered basket. Too bad its over 100 here in AZ. Picnics are for December here. I also love your little kitchen for your daughter. So fabulous! Very cute - love the color - shocked it came from a spray paint - the color choices are so limited - but I love this color! And I love the little bench that the basket sits at. So Cute! After my tweet to you just a bit ago... I just KNEW you'd have something paintilicious you'd taunt me with.